If you live in the Duncan/Cowichan Lake area, you may have noticed one of the two DriveBC HighwayCams on Highway 18 has been unavailable recently. Don’t worry – it’s not down for good. It’s actually being moved to a nearby location. DriveBC HighwayCams don’t always stay put. The current Highway 18 webcam relocation got us thinking it would be helpful to you if we explained some of the reasons why we might move a webcam. If we shift a webcam’s gaze, it’s likely due to at least one of the following five factors. Mainroad South Island Contracting owns and maintains the Highway 18 webcam, which had been running on solar power and a weak cellular signal since it was installed nine years ago, causing reliability issues. 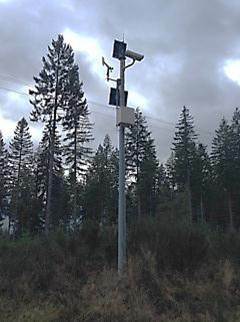 Since there is a second HighwayCam further down the highway, at Skutz Falls, Mainroad decided the webcam would be more useful if positioned at the South Shore Road/Pacific Marine Road intersection, which connects Lake Cowichan to Port Renfrew as part of the Pacific Marine Circle Route. A webcam will go dark at night unless it has sufficient lighting. Some webcams rely on streetlights, and some webcams are equipped with an infrared illuminator, which provides light long enough for the webcam to snap a good shot without distracting drivers. But not all webcams have either of these light sources. In these cases, you can get an idea of traffic levels by the number of headlights, but actual road conditions remain a dark mystery. Two street lights at the new Cowichan Lake location will provide ample light for the webcam, which had been going dark at night at its old location. Webcams are sometimes involved in vehicle incidents or damaged in some other way. A webcam’s power may be cut, the supporting pole for the camera may be broken, or any number of things could happen to reduce its performance. To prevent a webcam from being damaged repeatedly, we may move it to a safer location. When appropriate, we choose to install webcams facing north to avoid glare from the sun, but there are other environmental hazards that may warrant a move. For example, if a webcam lens is affected by spray or debris from heavy traffic, we might move it to another spot. A webcam is here, but not for long. In an effort to protect your privacy, we present webcam views at low resolution. However, if we receive a complaint from a resident concerned about, say, their home being visible in a webcam view, we will consider changing the webcam’s direction or location. The DriveBC HighwayCams network includes nearly 400 views at about 290 locations (and counting!) across the province. We want B.C. travellers to know what to expect – from traffic levels to weather/road conditions – before committing to a route. We’re always looking for ways to improve this service, and sometimes that means finding a webcam a new home. Hopefully this blog post answers your questions. Please feel free to comment below if a query moves you. What on earth are THEY thinking? And who are THEY That is who is we need to connect with. Sorry to hear your frustration. There had been a number of issues with this cam since it was installed nine years ago; mainly because it used older technology with solar power and had a poor cellular signal. We did manage to redeploy a camera with updated technology, and a customized set up in very near the same area (Cowichan). It is our hope that this will mean improved reliability, communication and most importantly, safety. Hope that this helps! Thanks for connecting with us. We understand the importance of the Cowichan BC HighwayCam on Hill 60, and we are working with the Vancouver Island District Operations Manager and the ministry electrical folks to find a way to redeploy a camera to the area to address the concerns. We hope that, with advances in technology and a custom set up, there will be improved reliability in both power and communications. If you have any other questions, please let us know. Thanks! Hill 60 is the worst part of highway 18, I used that webcam a lot: for that part of the highway is quite unpredictable in the winter months. You moving the camera to Pacific Marine Rd intersection isn’t a decision I agree with. Adding a camera, yes, but to lose one on this stretch of highway was not in my opinion is not well out thought only a poor choice by persons not affected by the loss of that webcam. That webcam helped the people of Lake Cowichan & Youbou make informed decisions on the conditions of HYW 18 was safe to travel to Duncan. The camera that was there needs to be put back or put another on 18 by hill 60. I agree with everyone above, especially Wendy Klyne. The road conditions on 18 are not the same anywhere else including the back roads, it is our lifeline, and it needs to be safe and cameras help to know whether we go or stay, but emergency vehicles need to know as well.We check the cams before we get on the highway when it snows, it is vital to us who travel daily. 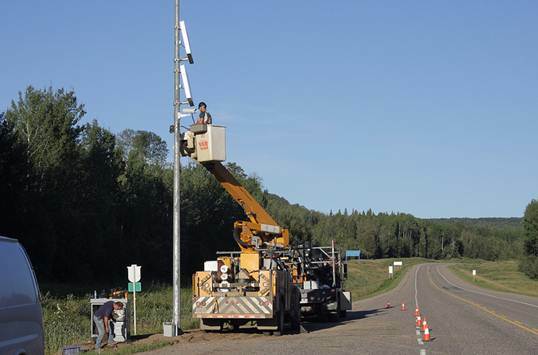 We hear your concerns and understand the importance of the Cowichan BC HighwayCam on Hill 60, and we are working with the Vancouver Island District Operations Manager and the ministry electrical folks to find a way to redeploy a camera to the area to address the concerns. We hope that, with advances in technology and a custom set up, there will be improved reliability in both power and communications. If you have any other questions, please let us know. Thanks! I just received a reply from the Ministry of Highways saying they have no control over where the webcam goes, it is at the discretion of the highway maintenance guys as they own the webcam. It is absolutely ridiculous to put it at the South Shore Pacific Highway location. NO ONE GOES ON THAT ROAD WHEN IT IS SNOWING!!!. We travel to Duncan daily and need to know what the road conditions are like. There are more than one weather climate on the road and we need BOTH webcams. Buy another one. I am sure your contract with the government which is paid for by our tax paying dollars allows you to put another one up. We understand the importance of the Cowichan BC HighwayCam on Hill 60, and we are working with the Vancouver Island District Operations Manager and the ministry electrical folks to find a way to redeploy a camera to the area to address the concerns. We hope that, with advances in technology and a custom set up, there will be improved reliability in both power and communications. If you have any other questions, please let us know. Thanks! I agree with the comments above. I used the Hill 60 cam on a regular basis, especially in the winter. I found it at least as reliable as the Malahat cams that seem to go down with the hint of winter weather. Thanks for the feedback Doug. We will send your comment on the Hwy 18 cam along to our HwyCam guy for future consideration. I agree with the comments above, I used the camera regularly. It was at least as relyable as the Malahat cameras that seem to go down with the hint of bad weather. Thanks for the feedback. We are forwarding your comment along to our HwyCam guy for future consideration. why is it that highways doesn’t have a webcam on highway19 on top of the tsitika summit by the weather station between sayward and woss. The highway 18 Cam was extremely useful for snowfall status in the location it was. Thanks for letting us know your opinion on this move, we really appreciate it. We are sharing it forward with the district. Hill 60 is the worst part of highway 18, I am sorry to tell you that moving the camera to Pacific Marine Rd intersection isn’t a decision I agree with. Adding a camera, yes, but to lose one on this stretch of highway was not in my opinion a well thought out choice. Thanks for connecting with us about this. We are sharing your comment forward with the district. The Hwy 18 camera that was removed from Hill 60 area “This cam is currently unavailable. It is being moved to another location in the area. Stay tuned!” has been moved WELL out of the area to Mesachie Lake and the Circle Route – a route that is only well traveled in the summer months not during inclement weather like today! Commuters relied on that camera. Sure would be nice to see what it’s like on Hwy 18 instead of guessing if we should try to go into Duncan or not! The camera at Skutz Falls junction does NOT give an idea of what is going on at Hill 60 where the other camera was. There are huge differences in the locations; huge. Ask commuters. Ask those that plow the highway. None of your 5 reasons makes too much sense. The camera at Hill60 was well used for years and as reliable as most other cameras. Thanks for connecting with us, and letting us know of your concern. I’ve asked our HwyCam guy to consider your request for future BC HighwayCam locations. Just to reassure you, requests for B.C Highway Cam installation are added to our plans for future locations. Our team is always grateful for feedback because we rely on it when choosing new camera locations.